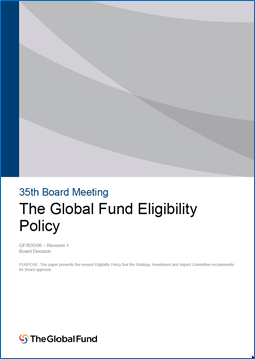 A consultant, Meg Davis, has written a blog on the proposed changes to the Global Fund’s Eligibility Policy. Davis says that she has been “immersed in this labyrinth policy” as a consultant for the three civil society delegations on the Board: the Developing Country NGO Delegation, the Developed Country NGO Delegation and the Communities Delegation. The blog was posted on 28 March. The Strategy Committee has been discussing the Eligibility Policy and will recommend changes to the policy at the next Board meeting on 9–10 May in Skopje, Macedonia. EDITOR’S NOTE: Meg Davis’ blog is three things in one. First, it states the position of the civil society delegations on some elements of the Eligibility Policy. Second, it provides an update on what appears to have already been decided regarding certain elements of the policy that the Strategy Committee plans to submit to the Board. Third, it provides an explanation for how certain elements of the policy work. Note that the contents of the blog represent the views of the three civil society delegations. The blog does not capture the views of other Board delegations ––including the donor country delegations, the private sector delegations and the implementing country delegations. Finally, it is unusual for a delegation, or a few delegations, to debate in a public way policy issues that are still under discussion by Board committees and that have not yet been discussed by the full Board. Nevertheless, we think that it is appropriate and useful to have this type of public discussion. It stimulates debate and contributes to the transparency of the Global Fund. Davis said that the three civil society delegations came together to press for an overhaul of the policy but that for a variety of reasons “that didn’t happen.” But there has been some progress, Davis says, and there are some big questions for civil society to weigh in on before the Board meeting. Davis said that the policy being proposed to the Board will reduce the disease burden classifications from the current five (low, moderate, high, severe, extreme) to two (high and “not high”). As before, for country applications all low-income (LIC) and lower-middle-income countries (LMIC) are eligible across the board, while upper-middle-income countries (UMIC) are eligible for any components that have a high disease burden. Under the current policy, components that are newly ineligible can receive one allocation (normally, three years) of transition funding to tide them over. Davis said that the proposed policy provides that the Secretariat can request a second allocation of transition funding in individual cases. The first group consists of the HIV components of three UMICS –– the Russian Federation, Romania and Bulgaria –– because they are not on the list of overseas development assistance (ODA) recipients maintained by the OECD Development Assistance Committee (DAC). This is a list that many donor countries use to guide their foreign assistance, Davis explains. The second group is the members of the Group of 20 (or G-20). Under the current policy, members of the G-20 are not eligible for HIV funding unless they had at least a severe disease burden. The result is that Argentina, Brazil, China and Mexico are excluded because their disease burdens are not significant enough –– while India, South Africa and Indonesia remain eligible because they have severe disease burdens. Davis said that Romania and Bulgaria have remained ineligible under the NGO Rule because of how “political barriers” has been interpreted. Davis said that although the civil society delegations pushed for revised language for the “political barriers” provision, “so far that has only resulted in even more confusingly elaborate new proposed language.” Davis said that this is an important area for HIV and human rights experts to weigh in on before the Board meeting. Davis stated that the civil society delegations pushed to expand the NGO Rule to cover the excluded G-20 countries (Argentina, Brazil, China and Mexico). “That didn’t happen,” Davis said, “but there is a commitment to discuss some other form of funding for communities in ineligible UMICs. This discussion will happen when the Board starts to look at its allocation method this summer.” Davis said that she fears funding for these communities will come out of the catalytic funding stream (see Davis’ blog for an explanation of why she believes this is problematic). The blog concludes with suggestions for what civil society can do between now and the Board meeting; for what civil society should monitor once the proposed policy goes into effect; and what civil society should think about for the future with respect to eligibility.